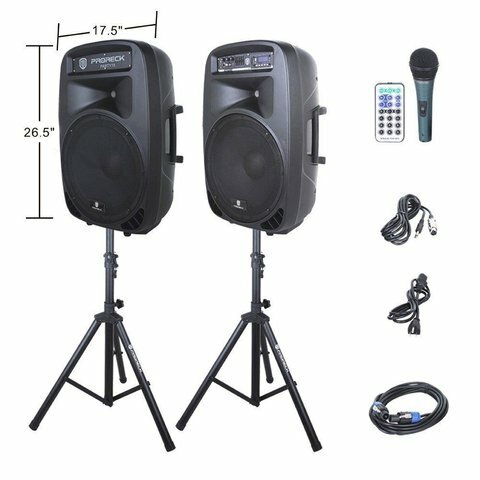 Our 9-piece PA system, with which you can easily enjoy the powerful sound, is composed of an active speaker, a passive speaker, a microphone, a wireless remote control, a speakon cable to connect the passive speaker to the active speaker, a power cable, a microphone cable as well as 2 speaker stands. This all-in-one set is a great choice for DJ, anniversaries, backyard weddings, home studios, speech, social gatherings, etc. The PA System features Bluetooth /USB/SD Card Reader/ FM Radio functions, allowing you to enjoy the versatility of this unit. More attractive, this system has a LCD display clearly indicating the mode you choose with the wireless remote control allowing you to switch the mode when you are far away. The speakers also have built in LED lighting to help light up your party during the day and night!